Good location to Disney Good clean decent and nice hotel. Close to Disneyland. Shuttle to the parks could be better. Friendly staff. Sure, living vicariously through your mates' travel posts is fun. But with such an amazing range of hotels in Anaheim, why not take a break and shoot your own #TravelEnvy masterpieces instead? 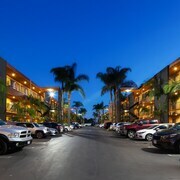 You'll discover 118 hotels within a 5-kilometre radius of downtown Anaheim on lastminute.com.au. Choice AND convenience? Winning! Avoid the FOMO — stay close to all the hustle and bustle at the Anaheim Majestic Garden Hotel and the SpringHill Suites Anaheim Maingate. If they don't get you excited, the Holiday Inn Hotel & Suites Anaheim and the Hotel Ménage are also close by. 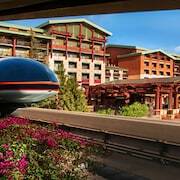 You can find 146 hotels in the favoured suburb of Disneyland - Anaheim, located just 3 kilometres from the CBD. Check out the amenities at the Disney's Grand Californian Hotel and Spa and Disneyland Hotel - On Disneyland Resort Property. Eager sightseer or chilled-out globetrotter, Disney California Adventure® Park has to be seen! 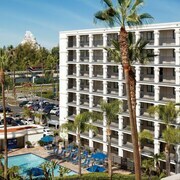 The Disney's Paradise Pier Hotel-On Disneyland® Resort Property and Dolphins Cove Resort are a stone's throw away. Drop off your bags, grab your smartphone and wander on over. The Embassy Suites by Hilton Anaheim Orange and the DoubleTree by Hilton Anaheim - Orange County are near the Discovery Science Center. Handy, right? The Bowers Museum, another amazing sight, is just a breezy stroll from the Best Western Plus Meridian Inn & Suites, Anaheim-Orange and the ALO Hotel. If Crystal Cathedral is right up the top of your must-see list, you may want to book a night at the Residence Inn By Marriott Anaheim Resort Area or the Residence Inn by Marriott Anaheim Maingate. 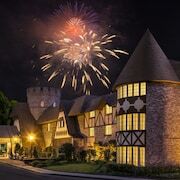 The Fairfield Inn & Suites Anaheim Buena Park/Disney North and the Courtyard by Marriott Anaheim Buena Park also have rooms available for those looking to chill closer to the Medieval Times. Enjoy a genuinely local experience with the whole family at Anaheim Indoor Marketplace. Need a room for the night close by? No dramas, we've got your back. 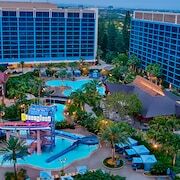 Howard Johnson Anaheim Hotel and Water Playground and Anaheim Fairfield Inn by Marriott are practically around the corner. Keen art lovers will be enthralled by the visually engaging exhibitions shown at MUZEO. Carousel Inn and Suites and Best Western Plus Park Place Inn - Mini Suites are a couple of suitable hotels if you don't want to stay too far away. 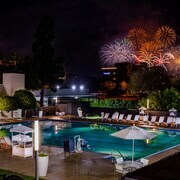 After being squashed in a cabin seat for hours, a nice comfy bed at The Duke Hotel Newport Beach will feel like a dream! If that doesn't quite cut it, have a gander at the Carlton Hotel Newport Beach, a Hyatt Affiliated Hotel. Both are within easy reach of John Wayne Airport, which is 18 kilometres from Anaheim's centre.